ONE+CALL is Regent Promotions’ simple solution for all of your Marketing, Advertising & Consulting needs. No longer do you have to waste time and resources chasing down multiple vendors. 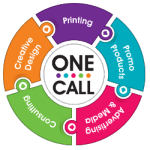 No longer do you have to worry about maintaining branding guidelines because you have one company printing your letterhead, another company handling your custom apparel and more companies handling your promotional items and advertising. Stop the madness. Make the call. Regent Promotions ONE+CALL.